The Week 14 Monday Night matchup brings a pair of teams with playoff aspirations to the table, as the Vikings head west to Seattle to play the Seahawks. The Seahawks are favored by three, and the over/under total is 46. The Implied Score is Seahawks 24.5, Vikings 21.5. The Vikings have averaged 5.6 yards per play this season (T-16th in the NFL), while allowing 5.3 yards per play (tied for sixth-best in the NFL). The Seahawks have averaged 5.7 yards per play this season (T-13th in the NFL). Defensively, they are allowing 6.1 yards per play this season (only three teams – Dolphins, Bucs, Raiders – have been worse). Seahawks receiver Doug Baldwin (groin) did not practice this week and he's a game-time decision. Rashaad Penny is questionable due to an ankle injury, which caused him to pop up on the injury report Saturday. Linebacker K.J. Wright (knee) is out. For the Vikings, Stefon Diggs (knee) did not have a designation on the team's final injury report Saturday. Cornerback Trae Waynes has been ruled out with a concussion. Linebacker Eric Kendricks (ribs) is listed as questionable. Adam Thielen ($17,700 DKC | $14,500 FD) – The scoring differences on DraftKings make Thielen the highest-scoring player in this game based on season averages (he's third-highest on FanDuel, behind the two starting QBs). Fading him entirely is a bold strategy, but he's had relatively quite performances in three of his last four games despite finding the end zone three times during that span (4-22-1, 7-66-0, 8-125-1, 5-28-1). On DraftKings, avoiding the 1.5x multiplier and using him with a regular roster spot for $11,800 might be as much as I'm willing to tempt fate. Stefon Diggs ($16,200 DKC | $14,000 FD) – Diggs saw his second smallest target share of the season (14%) in the Vikings' loss to the Patriots last week, but the lack of an official injury designation heading into Monday night bodes well for his chances of playing his usual share of the snaps. Aldrick Robinson was the biggest beneficiary of Diggs being limited, as he was on the receiving end of 20% of Kirk Cousins' targets in Week 13. It's also worth noting that Robinson saw a 14% target share in Week 9 against Detroit, a game in which Diggs did not play. Since the price difference between Diggs and Thielen is small, it would not surprise me at all if Diggs is the most faded pricey player on the board in this matchup, which could make him an underutilized Captain/MVP selection. Prior to last week's 5-49-0 showing in New England, Diggs had at least 22 DraftKings points (18.9 FanDuel points) in each of his previous three games. 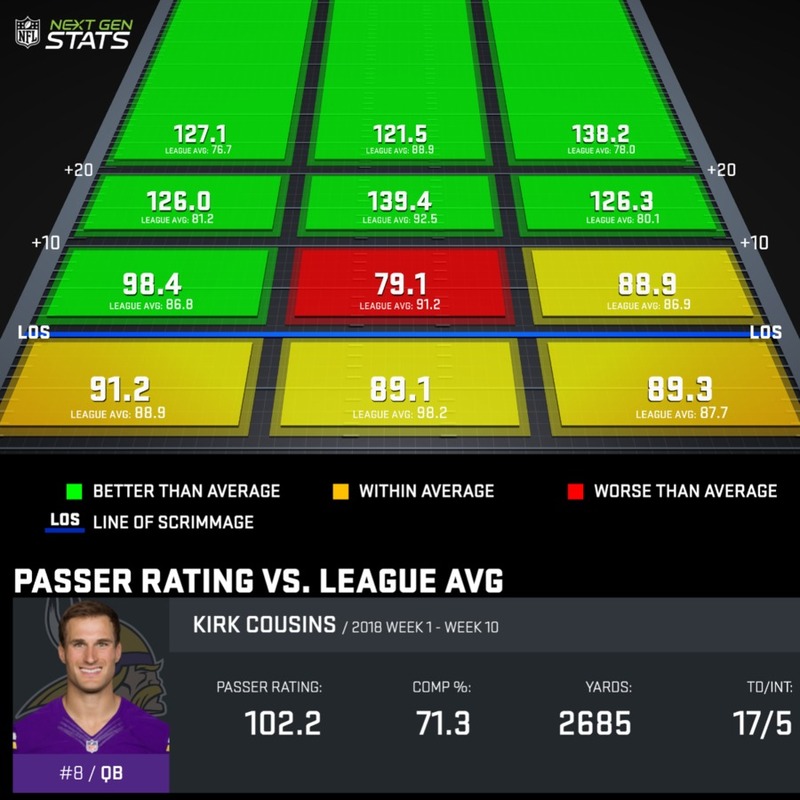 Kirk Cousins ($15,300 DKC | $16,000 FD) – Cousins enters Monday night with the lowest YPA of his career (7.1) for any full season in which he's held a starting job, but he's connecting on a career-high 71.3% of his passes, and he's been very effective throwing downfield. He's gone over 300 yards on five occasions – and over 400 yards twice (on the road against the Packers in Week 2 and the Rams in Week 4), flashing big-game potential when shootouts arise. He's slightly cheaper than Russell Wilson on both sites, and he has the easier matchup on paper Monday despite being on the road. Dalvin Cook ($13,200 DKC | $12,000 FD) – Cook has looked explosive in each of the last two games, finding the end zone as a receiver against the Packers in Week 12, and turning nine carries into 84 yards against the Patriots in Week 13. He had 17 total touches against New England – his highest total since returning from a four-game absence in Week 9, and second-highest total of the season (Week 1 vs. SF, 22 touches). The Seahawks have allowed 5.1 YPC this season (tied for the league-worst mark), making this a great potential spot for Cook, especially if the coaching staff bumps up his carry load. Latavius Murray hasn't disappeared from the offense (19 carries in the last three games compared to Cook's 28), but Cook has seen the overwhelming majority of the passing-down work with a 16:2 target edge during that span. Russell Wilson ($16,800 DKC | $16,500 FD) – Wilson has thrown multiple TD passes in all but one game this season, and yet, his per-game output is merely very good rather than great. Entering Week 14, no team had a more run-heavy playcalling split than the Brian Schottenheimer led Seahawks (56.1% run plays). Will the gameplan change considerably against a Minnesota defense giving up 3.7 YPC? Seattle's offensive line has been better than the 2017 version, but can that unit provide ample protection for Wilson against a strong Vikings pass rush? Tyler Lockett ($12,300 DKC | $12,500 FD) – Lockett is averaging a ridiculous 13.0 yards per target this season, as he's already pulled in a career-best 12 passes for 20+ yards and five for 40+, while matching his TD total (9) from his previous three NFL seasons combined. In the games that Doug Baldwin has been able to play, Lockett has averaged 4.2 targets per game. Without Baldwin, Lockett has been targeted 13 times in two contests (6.5 per game). Regardless of whether Baldwin plays Monday, Lockett figures to draw regular matchups against Xavier Rhodes on the outside, which only increases the likelihood that he'll be big-play dependent again Monday. If I were building a cash-game lineup for this slate, Lockett would not be in it, but he's a perfectly fine play for tournaments, and likely an underowned option for the MVP/Captain spot. Chris Carson ($11,400 DKC | $12,000 FD) – Since missing the Week 10 matchup against the Rams, Carson has played the largest share of the snaps in the Seattle backfield in each of the last three games. Surprisingly, Carson also leads the Seattle running backs in targets over the last three weeks (6), while Mike Davis' role appears to have shrunk (3). As noted above, the Vikings allow just 3.7 YPC, so it might be tough sledding for the Seattle backfield, but Carson figures to be the high-priced player on the Seattle side most frequently omitted from tournament lineup builds despite having back-to-back weeks with the Seahawks' largest share of red-zone opportunities (carries and targets inside the 20-yard-line). Doug Baldwin ($10,500 DKC | $10,000 FD) – Given the uncertainty about his health, I'm hesitant to pay the premium for Baldwin as a Captain on DraftKings, or to go a very contrarian route on FanDuel and plug him is as the MVP. Even using him as a regular roster piece on both sites carries considerable risk if he's active (he's averaged 7.8 YPT this season; the second-lowest mark of his career), but it's worth noting that Baldwin has seen at least 22% of the Seahawks' targets over the last four games. David Moore and Jaron Brown tend to see more targets if Baldwin is unable to play (Moore played nearly twice as many snaps as Brown in Brown's surprising 2-TD showing against San Francisco last week), and their appeal increases with the likelihood that Lockett would draw frequent coverage from the Vikings' top corner, Xavier Rhodes. Kyle Rudolph ($4,800 DK | $8,500 FD) – With a light season average (8.7/FPPG DK, 6.8 FD), Rudolph might be an afterthought Monday. Rudolph hasn't scored since Week 3, but he's averaging a career-high 7.7 yards per target this season. Aside from a price that should help keep ownership rates in check (at least on FanDuel), I like that Rudolph is on the field a ton. He's played at least 90% of the Vikings' snaps in four straight games, and his red-zone opportunities this season (11) aren't that far off from Thielen's (18) or Diggs' (13) total. David Moore ($5,200 DK | $9,500 FD) – Moore won't sneak up on anybody at this point since he's had a few big games (two TD in Week 5, 4-97-1 in Week 8, 4-103-1 in Week 12) despite an inconsistent role in the Seattle offense. The risk comes from what appears to be a slightly declining role, as Moore has dropped to 50 and 48 percent snap shares the past two weeks while Malik Turner and Jaron Brown have seen slight increases in usage. He's a tournament-only consideration on both sites. On DraftKings, defenses are in play. This week, the Seahawks ($3,800) and Vikings ($3,600) are reasonably priced, just ahead of the two kickers. Although the Seahawks lean run-heavy, they're allowing more than three sacks per game this season, ranking them among the league leaders, while the Minnesota defense has averaged three sacks per game through 12 contests. Aldrick Robinson ($2,200 DK | $6,500 FD) – Like Moore, Robinson's previous heroics will put him on the radar with a decent ownership rate (he had a two-TD showing against the Rams on a Showdown slate in Week 4), and a season-high nine targets against New England (5-37-0) last week should bump up interest as well. Robinson has caught 84 passes since becoming an NFL player in 2012 – 20 of those receptions have gone for 20+ yards, and eight have gone for 40+. If you're looking for a player with a good track record of doing a lot with very limited opportunities, Robinson is one of two players in this matchup who checks those boxes (the other is written up below). Nick Vannett ($1,800 DK | $6,000 FD) – On FanDuel, the cost is the same, but the price-break on Ed Dickson ($400 DK | $6,000 FD) might push him into a few lineups that opt for more top-heavy builds on DraftKings. Vannett had a red-zone target in four straight games (Weeks 8-11), and he's run a route on 93% of his opportunities to do so (Dickson is at 88% of the season). The appeal with Vannett is that he's been targeted more heavily than Dickson in five of the Seahawks' last six games – including 18 and 22% target shares in Weeks 8 and 9 against the Lions and Chargers. Given the somewhat steep difference in price on DraftKings, Dickson vs. J.D. McKissic ($200 DK) for the final roster spot might be the more frequently considered toss-up. McKissic was targeted once in the red zone late in the Week 13 win over San Francisco, but with Chris Carson, Mike Davis and Rashaad Penny (health-permitting) all presumably ahead of him on the depth chart, Dickson should see the field considerably more by comparison. Jaron Brown ($1,400 DK | $9,500 FD) – The FanDuel price on Brown is silly, though the surprising 2-TD game from last week will likely crank up the interest at his price on DraftKings. Brown has 97 career receptions over six seasons, and 24 of them have gone for 20+ yards. Brown hasn't played 20 snaps in a game for Seattle since Week 6, so the usual GPP-only caveats apply.